Permits central control and monitoring of multiple laser systems from one computer. Enables a distributed systems control architecture thereby limiting laser system operator interaction with equipment. Frees up host computer for CPU-intensive tasks. Users benefit from both centralized and distributed control of XLS laser systems with the Embedded PC option. This feature gives users the ability to connect over Ethernet or WiFi to XLS laser systems via the Laser System Manager (LSM). The topology for control and monitoring a XLS laser system with the Embedded PC option is completely flexible. 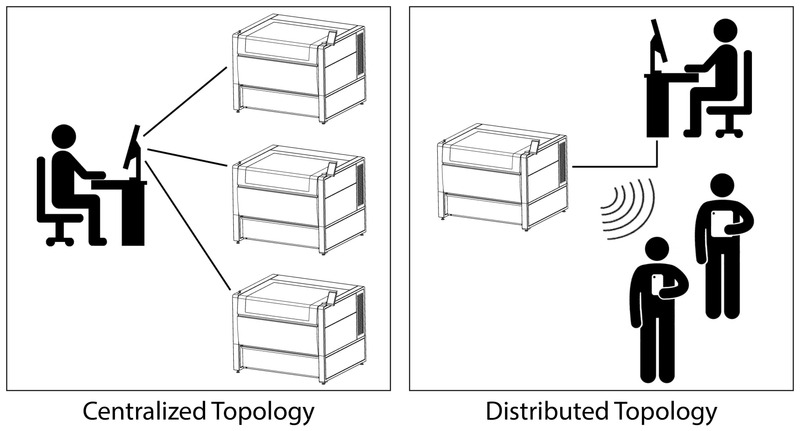 This topology can range from a centralized model of one user interfacing with many XLS laser systems to a distributed model of many users interfacing with a single XLS laser system. The Embedded PC directly controls all functions of the XLS laser system, resulting in a minimal amount of information being exchanged over the remote link, permitting real-time monitoring of all aspects of Embedded PC XLS laser systems from a central control point, as well as real-time control of all functions including job selection, job parameters, and job control. Printing and Direct Import are supported over the remote link as well. In many organizations, it is desirable to separate process control from machine operation in order to maintain process consistency. The Embedded PC option promotes process consistency by allowing task segmentation between operators and process controllers to occur for laser material processing with XLS systems. Operators can focus on laser system operation without being concerned about any process parameters while process controllers are able to remotely monitor and control all aspects of any XLS system connected to the local area network, enterprise-wide. Controlling the XLS laser system requires substantial computational resources to ensure optimal performance. The Embedded PC option is a comprehensive solution for cases where the host computer must be used for other CPU-intensive tasks such as: 3D-Rendering, CAM, and Finite Element Analysis. The Embedded PC takes on 100% of the XLS control tasks, completely offloading the host computer and allowing it to perform system critical tasks as required without affecting the operational integrity of the XLS laser system. © 2018 Universal Laser Systems, Inc. All rights reserved. Universal Laser Systems logo and name are registered trademarks of Universal Laser Systems, Inc. All other company and product names are trademarks or registered trademarks of their respective companies.